The pilgrimage Shichfukujin, the 7 lucky Gods, is one of the popular worshippings in any place of Japan. Most of the towns in Japan has temples and shrines that enshrine each one of 7 Lucky Gods. Every town and city of Japan have this 7 lucky gods tour. Not only Goshuin, the red sign, but some of the tours has special dolls, figures, and great gifts. 7 Lucky Gods Tour travels famous temples and shrines of each location. So, it is simply great tourism. Most of the sacred statues are open for public only early January. So, collect the good luck at the beginning of the year! Ebisi is the lucky god with a fishing pole on right hand, and red bream on left hands. Ebisu is the only Japanese God in 7 Lucky Gods. Benzaiten is the only Goddess in 7 Lucky Gods. She was originally Indian Goddess. Because she carries a guitar, people think she is the god of entertainment. However, she is actually a god of water. Benten Shrine in Japan always located near water. Bisyamonten is Indian God of War. It is also known as Tamonten in Japan. He is not only the god of war, but also the god of treasure and wealth. He wears yellow armor, a pagoda on the left hand and a spear on right hand.He is stepping on the evil with his angry face. Fukurokuju is Laozi in China. His name is made from, Fuku of Lucky, Roku of wealth, Ju of eternal life. He has long head, long beard, stuff and his partner crane. Hotei is Zen priest who existed in China during 10th century. His real name is Kaishi. Hotei has a huge belly and great smile. He has a fan called Bashosen and like Daikoku, he has a lucky bag. Jurojin is the founder of Taoism. It's the wizard who turned out from Laozi. He wears a cute cap, and has a long stuff and a deer as the partner. Daikokuten has a hammer with the right hand, and a lucky bag on left hand. Then, he stands on two straw rice bags. He is the combination gods of Indian god and Japanese god. Asakusa Shichifukujin (浅草七福神) is one of the popular tour of Asakusa. The traveling Shichfukujin, the 7 lucky Gods, is one of the popular worshipping in any place of Japan. Most of towns in Japan has temples and shrines that enshrine each one of 7 Lukcy Gods. Asakusa also has those temples and shrines. There are 9 shrines and temples for Asakura Shichifukujin. 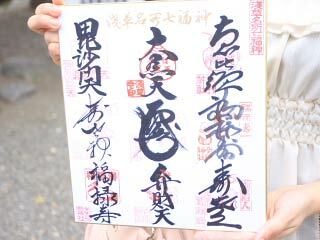 They have special Gosyuin, the autographs of each God. The traveling Shichfukujin is praying your good luck and correcting their lucky Gosyuin. Each Gosyuin is 300yen. The special paperboard is 300 yen and you can buy it any of those 9 temples or shrines. When you get Gosyuin, you can also get a map. Office open from 9:00 ~ 16:00. When Yoshiwara Shrine closed, visit at Senzoku Inari Shrine to get Gosyuin. It is about 10km long walking to visit all shrines and temples.